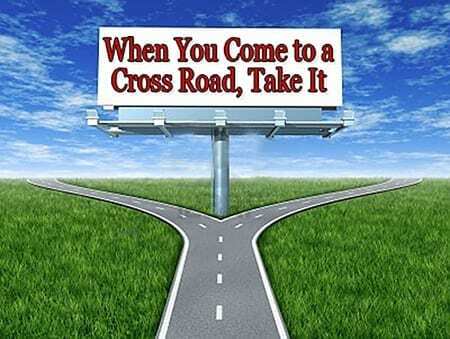 The title of this teaching is When You Come To A Cross Road, Take It. The key word is cross. This is our March/April teaching, and April of this year we celebrate what is usually known as Easter Sunday when we celebrate the resurrection of Jesus Christ. No resurrection would have occurred had he not died. What we are going to look at in this teaching is the pattern of the Cross, death unto life, that each Christian is called to live on a daily basis. Now, you can see from the title of this teaching, cross road is two words; otherwise, you might think that we would be into saying things like what Yogi Berea would say. Now, that is pretty esoteric but he was a former New York Yankee’s catcher who was known for sophistry, which is something that sounds wise until you think about it. He said, “When you come to a fork in the road, take it,” but this is not like that. When I laid this out originally, the first title that I thought of was “Suffering, Faith, Character, and Glory.” We will see that this will be all about the biblical relationship among suffering, faith, character, and glory. First we will talk about suffering. I am talking about both from external and internal sources. The external would be in the category of persecution. I really do not know much about persecution from without. If I were living in the Sudan, Pakistan, India, or China as an outspoken Christian, then I would probably be suffering from that kind of persecution. Another kind exists. It is from the internal enemy, the sin that dwells in us, and the godly sorrow and repentance that we are called upon to embrace. Suffering is thus a given based upon the fallen world in which we live and the internal enemy in each of us. Faith is the next issue. Faith is not a given, it is a choice. How do I meet suffering? If I meet suffering with faith, that is trust in God and His Word, then I build character, which is the third one of these. God works with me to build the character of Christ in me, and the result is glory. Jesus Christ’s life is our prime example of this sequence among suffering, faith, character, and glory. In conjunction with this teaching, I want to refer you to another piece of work that we have done that will enhance this one, it is an audio teaching called Defeating the Enemy Within. This teaching is very challenging for me to do. I think that this is what Christianity is all about. I realize that I do not totally understand it and I am approaching this teaching gingerly, to say the least. Maybe I feel like I am even backing up to it, so it will think that I have all ready done it. I am reminded as I read these verses about my own life as it flashes before my eyes when I had not adhered to them, yet it is still God’s Word, and I do not think that I am a Lone Ranger in this because you live in the same fallen world that I do and face the same internal enemy. Another reason that this is challenging is just because I teach it; I do not think that I will perfectly apply it after I teach it. It is also a teaching that pierces my heart, and that is not something that immediately appeals to me—that my heart is pierced. It is like, “Faithful are the wounds of a friend.” It hurts the same as when an enemy sticks you as when a friend sticks you. Another reason that this is challenging is because some of this seems far beyond me at times, and yet if Jesus Christ is who he said he is and did what the Bible says he did then it is within our reach. If we do not at least set these things before us as a goal, then we will never get to them. This is about a journey. It is about a walk. It is when you come to a cross road; it is not if you come to a cross road. I promise you that you will come to cross road after cross road. No question in my mind that I need to hear this at least as much as you do and maybe more. We are in this thing together, and I pray that what I am seeing in my own struggle against sin as a quote from Hebrews 12:4, which we are going to see, will help you in yours. I think that for each of us as Christians, life is a crucible. A crucible—I looked it up in the dictionary. It is a “container in which a substance like perhaps gold or silver is purified by fire.” It is where the dross, the impurities, is separated from the pure gold. Even though life is a crucible, I think that times occur in our lives—I have felt this way lately, that life is more of a crucible. I think that I am speaking from inside a crucible, so I hope that you can hear me. God, our precious Father, wants to work with you and me, and He realizes with whom He is working to the end that the nature of His Son, Jesus Christ, a new nature shines forth in our daily lives. This is the present part of salvation sanctification. A past, present, and future exists for each of these, and we will be seeing that. One way that God does this is by bringing us to cross road after cross road. The ball then is in our court. The choice is yours, and the choice is mine at each cross road. If I make the right choice, the choice of faith, then He will strengthen me to walk it out all the way to the joy that is set before you. In this article, we will see that “death unto life” is to be a godly pattern of a Christian’s daily life. I want to try to clarify that in this teaching. It means that we choose God’s will rather than our own when the two are different; thus we “die to self” by not going the way that we may feel like or the way that we want to go but instead choosing to do what He says. The path of “death to self” is the only path to life—that is resurrection life, which is receiving the blessings that God longs to give us. We are going to talk about how if you lay down your life; you will find it. If that hope of finding something is not real to me, I am not going to do it. I am not going to give up what I have in the present, which may look good or even very good. I will not give that up without a hope of something better. That hope is not going to be real; unless God and the Lord Jesus are real to me. We are going to talk about growing into this because the more time that I force myself to do this and see the results then the next time I come to a cross road between flesh and spirit, I am more prone to take the right path. No matter how far we walk, cross roads will be there. The higher we go towards intimacy with our Lord, the more difficult the choices become. The Christian walk is a path of cross roads, and as Christ’s cross was the defining moment of history, I submit that the “crosses” (that is the choices) between my will and his will (the crosses that you and I have to face) are the defining moments of his story in our lives. That is to what extent the Lord Jesus Christ can live his life in us. That is what he is trying to do. This is all about choice, as it was with Jesus in the Garden of Gethsemane. The farther we walk then often the more difficult the choices become, but the more able we are then as we grow to make the right choices because of how we are educating our conscience step-by-step. Remember, your conscience is not some internal gyroscope with which you are born that always leads you to doing the right thing. Biblically, your conscience is your mind set, your habit patterns, the way that you have educated your thought process. In Romans 2, it talks about someone’s conscience and how it either is accusing or excusing him. It depends on how our conscience is educated. Noting the inner turmoil within yourself is obviously a good thing because if I am trying to say yes to the will of God and yes to my own will, which is contradictory to the will of God or even a slight step below, then I am going to have this turmoil. I am going to be racked on the inside. Many times then if I just know that I am going to do what God says, it does not mean that turmoil or pain does not end immediately. Deny yourself – that is crucify your will, put it to death. Now the word crucify is in the Scriptures too. Crucify the flesh and so forth. Does that indicate pain to you? Yes it does. I do not like physical pain, sickness, or externally imposed pain, but internal pain is worse in some cases. Anyway, Jesus said “if you want to follow me, deny yourself and take up your cross daily.” That is to say lay down your life; that is what you want for the sake of someone else. In a situation, you would then choose to do what is best for another. We are going to talk about motivational keys here. How do you get a handhold or a foothold on some of these things as you are climbing what sometimes seems to be the sheer face of a rock? By definition the Cross means pain. What would be an adjective that is sometimes used to describe a really bad pain? How about excruciating? That word means “out from the cross.” Now of course, anything that you or I suffer, I do not think, will compare to the true excruciating pain that Jesus suffered; therefore, his help, which is readily available to us, is more than sufficient for us—whether it feels like it or not. We can get to the place (we are going to read James 1, 2, and following where it says count it all joy when you come up against a lot of tough things) where we are thankful for the crosses that we face. We will be looking at what it means to take up your cross. Then some keys to entering into the process and hanging in there—the goal would be to embrace it, and the next thing would be to at least stay there as opposed to leaving. You do not want to make a u-turn in a crucible. We are then going to close with several sections in 1 Peter, which will talk about suffering. Now, we are going to look at a number of verses, one is coming up in Philippians 3 after a bit, that will have a key phrase “compared to.” This is about choices. This is about priorities. I think that this is the bottom line of Christian living. It is not some place that everyone wants to go. I hope and pray that as I share these things you [myself too] are getting motivated to do this. It is a lot easier to say these things than to do them in the crucible, but the Word is the Word. The key phrase here is more than me. We are supposed to love our mother and father deeply. (38) and anyone who does not take his cross and follow me is not worthy of me. Look at the context in Mark 8 of the same basic statement by Jesus, which is going to add another phrase. We will begin in verse 31. Peter comes in here—I will mention more about him when we close in 1 Peter because this is the same guy who wrote 1 Peter. Verse 31 is the key transition in the Gospels. He then began [This is the key word here.] to teach them that the Son of Man must suffer many things and be rejected by the elders, chief priests and teachers of the law, and that he must be killed and after three days rise again. They really had not heard anything like this—that he must be killed. As Jesus Christ’s chief associates, that were fairly visible with him, they might have figured, “Umm, let us see. If they get him, they might want to get us.” Anyway, I do not know if they heard the last clause of his sentence after kill. Their mind might have gone, “What,” but Jesus did say, “…and after three days rise again.” Almost everywhere in the Bible that the sufferings of Christ are mentioned, his ensuing glory is also mentioned. He spoke plainly [boldly] about this, and Peter took him aside and began to rebuke him. Jesus was not calling Peter Satan. He did not think that Peter was Satan. Jesus was rebuking the source of the assault, and the assault was upon Jesus to not go the way of the Cross but to take the easy way out and become the King and smoke the Romans. This is about Jesus’ closest associate along with the other Apostles, and there are some things for us to learn—you are going to have to go alone to your cross. I highly recommend a close group of mature Christian friends who know you and more importantly who know God and who can and do speak and who are bold to speak into your life; nonetheless, they cannot make the decision for you. You will have to go alone to your cross, just like Jesus did. You might not have anyone cheering you on or understanding the decision that you have to make; in fact, they may misunderstand it. That is why we want to know the will of God and then trust Him and obey. This “if” means it is not a given. It is up to me, and it is up to you. How closely do we want to come after him—that is follow him, that is be a disciple? (34b) …”If anyone would come after me, he must deny himself and take up his cross and follow me. Self-preservation is good in one way. We do not want to walk off a cliff but when it comes to preserving our own will at the expense of God’s will, who knows us better and loves us better, that kind of self preservation is not good. For whoever wants to save [preserve] his life will lose it, but whoever loses his life for me and for the gospel will save it. What would be some motivation for me in this verse? Well, it would be, “Okay, I am doing this for Jesus.” I would then think that through. Did Jesus do anything for me? Yes, he did. Would I want to reciprocate? Yes, I would. For me personally, that is a pretty good motivation. And what about doing it for the sake of the truth of the Word of God that He is committed to me? Absolutely! And, I hope that you feel the same way. I do not think that I am in touch with that as much as I should be, and then I have to get in touch with hurting other people. I do not want to just blow that off. In my life, I have usually bounced back pretty quickly and sometimes probably too quickly because I want to remember when I come to the next cross road of flesh and spirit and make the correct choice. Why would I want to take a cross road? Every cross is not as painful as every other cross, but the very wording here, “cross” equals pain, right away a connection is there. It depends on what element of your life that Jesus asks you to lay down. How much does it mean to you? Not everything is of the same priority, for Jesus and for the Gospel. You need to think about this. If I do not do God’s will, I am going to suffer anyway. So, then I think, “Well, even in this kind of a situation where it feels so painful, at least if I do this, I am going to suffer.” It is a cross. It is what it says, but it is a beneficial suffering. I am going to get what is on the other side of the cross if God’s Word is true. I am going to get something from this suffering. This kind of temporary suffering leads to glory because a moment on the Cross occurred when Jesus’ suffering ended. He died and after that came resurrection life. Gosh, this is easier to teach than do, but the Word still says this. A moment will come when the suffering ends and the joy of the Lord happens. Sometimes that is not so specifically delineated to us in the moment. We have to walk down the cross road in order to find it out. This is talking about the past tense of salvation—justification, sanctification, Romans has a lot about that, basically the first eight chapters. In two verses we have seen the past, the present, and the future. The past is that we have been justified. We have gained access into this grace. The present is that we now stand. The future is that we rejoice in hope of the glory of God. You might think of it like this: in the past, Jesus signed for you; the present, you are sealed; the future, you will be delivered. We could not have verse three if we did not have verses one and two. If “because” was not here, we would not rejoice in our sufferings. If we are going to rejoice in our sufferings, then we are going to have to go on the other side of the word “because” to get a handle on it. This is a word that we will see in James—”staying power,” “hanging around,” “keep going.” It is not necessarily concerned with pace but direction. Sometimes I have felt like I am crawling, inching forward. (4) perseverance, character; and character, hope. (5) And hope does not disappoint us, because God has poured out his love into our hearts by the Holy Spirit [holy spirit—the gift], whom [which] he has given us. We have the guarantee of future glory being consummated for us. In James chapter one we will see a similar truth. This is an exhortation that is not always the easiest thing to do, but it is available. We are going to face these kinds of things everyday of our lives no matter how spiritual that we become, no matter how mature that we become. Whose choice is it as to how I look at something? Now, what is the next word after kinds? It is another one of those “becauses.” These verses, 2, 3, and 4 really need to be read backward, but let us read them forward here first. The next two words are key words that we will see in several other verses. so that you may be mature and complete, not lacking anything. Now, we would all like to be mature and complete, not lacking anything. That is the end of verse four, so if we want to get there (mature and complete) we have got to come by way of verses two and three. That is the path by which we get to be mature and complete, not lacking anything. When I saw those words “so that” and realized how many times that phrase is in this teaching, I then thought of a play on words, “sow that.” It is a purpose word. It could be translated “in order that you may be.” This means that if what is on the first side does not happen then what is on the second side of that word combination will not happen either. That is why words are important in the way that they are used, and God’s Word is precise. When I thought of “sow that,” I thought of Psalm 119:11. What is the test? James 1:3, it is a test of faith. Faith is trust in God’s Word, so faith requires a promise. It is the Word of God in our minds that will be put to the test just like Genesis 3. Do I believe God’s Word or do I believe what the Devil says? Remember Acts 27:25? There is the boat, the storm, and the clouds for many days and then an angel came and told Paul, “Hey, you are going to be okay.” He said, “I believe God that it will be even as it was told me.” That to me is a classic definition of faith. That is why it is important to know God’s Word as we walk in this fallen world. Recently I heard a teaching, and someone said that word “generously” means “without second thought.” God is not the God of a closed fist but of the open hand. We ask , and we trust God to give us what we need. The Greek word for compels means more of keeping us “on track” than providing impetus. Christ’s love keeps us going in the right direction. That is only if we understand it and think about it. …that one died for all, and therefore all died. That is a summation of the doctrine of Romans. Of course, I believe that Jesus died; therefore, I died in him; therefore, I have risen; therefore, I have everlasting life in Paradise! Okay, what about now, in the grace where in I stand and the trials; the tests for the sake of other people. And he died for all, that those who live should no longer live for themselves…. If you are not living for yourself, then maybe you would be dying to yourself. That is the choice. Instead of living for myself, I would live for him—like he said, for me and for the Gospel. Did he do anything? Yes, he died for us and was raised again. How will I know his love? Sometimes I come to a cross road, and Jesus is right around the corner, but I cannot see around the corner. I have to make the turn. If it is a cross road, life will be there down the road. Again, it is about choice. If I do not go, then I will not know. What are the choices in the two verses that we just read? It is between the Last Adam and the First Adam. It is between Christ and self. So I coined the term self-flesh. I have been self-flesh more than once, but I always loose when I am self-flesh. What I want to be is self-less. It is a spelling situation here. The choice is between spirit, the new nature, and flesh, the old nature. The choice is between life and death. You never know how much you really believe anything until its truth or falsehood becomes a matter of life and death to you. It is easy to say that you believe a rope to be strong and sound as long as you are merely using it to cord a box, but suppose that you had to hang by that rope over a precipice? Would you not then first discover how much you really trusted it? Only a real risk tests the reality of a belief. I then have to ask myself, “How real is Jesus to me?” He must be more real than the other choice, or I will make the other choice. The goal is to take an external Book (the Bible), the heart and thoughts of God, and make it an internal commitment. We need to make it real and to hide it in our hearts. Many things in my life are pretty real to me, and some things are very appealing. Sometimes I have to make a choice between those and Christ—that is the will of God. More times will occur, as we grow, that the choice is between good and best than it is between good and bad or best and bad, so the will of God has to be more real. I have to develop that on a daily basis, or I will not make the right decision. I have to hide the Word in my heart. The more that I am gripped by what Christ did for me, the more I love him, the more I trust him, and then the more I will serve. I will act and say, “Okay, I will do something for you.” Otherwise, I say, “Thanks for dying for me; I will take it from here.” That will not get it. When I think of being gripped by what Christ did for me, the question would then be, “Do I feel a pull in the right direction?” Philippians 3 is a great section. …for which Christ Jesus took hold of me. I need to thus take hold of him. To the extent that I do that, then I am gripped; in other words, I am motivated. The Bible says that the Christian is a battleground between two natures. Because my old man (old nature), makes me a garbage dump with shoes. Romans chapters one, two, and three make that very plain as it describes the gruesome, internal reality of the sin nature. The more that I understand and face the sin that dwells within me (Romans is all about this), the more it can magnify God’s goodness, His grace, and His mercy to me, and then, maybe, I will choose to embrace the struggle, the process, with joy, because no matter how big the sin is, the grace is bigger. That is Romans 5 about the two Adams. A. W. Tozer talked about, “The meek man is he who has finally submitted to God’s assessment of himself and who has no pretense about it.” On the one side of us, we are a garbage dump with shoes. On the other side, we are everything that Christ has made us and everything that we are in Christ. Life is all about this tension. I have to get to understanding this because sin dwells; it is not visiting. If I want to be like Christ, then I am going to have to walk through it, and as it were, practically speaking, conquer it in his strength. How much do I really love the Lord Jesus Christ? How much do I really want to follow him? The better I know Jesus, the more I will love him, and the more I will follow him. In Philippians 3, Paul has just enumerated his credentials as a Pharisee of the Pharisees. Those were good things. That was what he was supposed to do as a Jewish person who wanted to be a Pharisee. We already read those kinds of things in Matthew and in 2 Corinthians: for me and for the Gospel, live for him, for the sake of Christ. Rubbish is a very bad translation here. It should be the word dung. Human excrement is what the word dung means. That is what the text says. That is what God intended people to read in this verse, then we are to stop and think, “Oh yuck, not very pleasant.” If I do not have a view of the magnificence of knowing Christ then other things are going to look closer to Christ; in other words, in comparison, they are going to look almost as good. This is not talking about salvation here; Paul was certainly saved when he wrote Philippians, but to consider things looking like dung compared to Christ. The key is to walk it out with Christ and see how wonderful he is, so that we never choose any other way than his way. (10) [For my determined purpose is] that I may know Him [that I may progressively become more deeply and intimately acquainted with Him, perceiving and recognizing and understanding the wonders of His Person more strongly and more clearly], and that I may in that same way come to know the power outflowing from His resurrection [which it exerts over believers], and that I may so share His sufferings as to be continually transformed [in spirit into His likeness even] to His death, [in the hope] (11) That if possible I may attain to the [spiritual and moral] resurrection [that lifts me] out from among the dead [even while in the body]. This is a great translation because this has nothing to do with any kind of bodily resurrection, and many people have misconstrued this verse to the detriment of their hearers. Look at it. It is talking about the same thing—dying to self and attaining that kind of resurrection. That I may attain to the [spiritual and moral] resurrection [that lifts me] out from among the dead [even while in the body]. That is an excellent rendering. “Out from among” are the key words in verse 11. My NIV Bible says, “from the dead.” The King James is worse, for it says, “of the dead.” The preposition “ek” means “out from among,” which implies that some do not go. They do not make it. This has nothing to do with the physical resurrection because every Christian will come up from the dead—those who have died when Christ shows up. This is in the context about pressing on, growing up, and that is what the next verses say. Verses 10 and 11, as the Amplified translation makes clear, are about being willing to feel his pain. What does that mean? It means the fellowship of sharing in his sufferings. It means that when I face either external or internal suffering that I am willing to make godly choices, that I am going to feel a measure of Jesus’ pain. That means that I am going to have to face the sin that dwells within me, and I feel the pain of godly sorrow or even external persecutions. As I have said, I am not very familiar with the external; I am more familiar with the internal. Let’s look at another section in 2 Corinthians and then Hebrews 12 that will contain some keys to embracing this process. We will then close with 1 Peter because I do not want to have anything to do with this process. A large part of me says, “Forget it. Don’t do that. Do not enter into that crucible. Do not go down that cross road.” Maybe I could look for little crosses that I could choose. Remember what the word cross implies—”not my will but thine.” Do you like to get your own way? I do because my way is best. You are probably the same way. You really like it when things go your way. You do not like it when things do not go the way that you want them to go. Well, have you learned that it is not always going to go your way? I am learning that. The word “servants” here implies that your will is really prevalent there. (6) For God, who said, “Let light shine out of darkness,” made his light shine in our hearts to give us the light of the knowledge of the glory of God in the face of Christ. Maybe you have heard the treasure being taught as holy spirit, but obviously in the context, it is “…the light of the knowledge of the glory of God in the face of Christ”; in other words, the Bible—remember he said, “For me and for the Gospel.” The treasure in your earthen vessel, your jar of clay, is the knowledge of the truth, the knowledge of the Word. See, knowledge is important. For me personally, that is a big motivation to taking a cross road because look at the quality of the Word that God has given to me and privileged me to teach and probably you would feel the same way. Maybe it is about Him wanting to get my character commensurate to or at least closer to that quality of the treasure—that the jar of clay exemplifies the internal treasure, that I decrease, and He increases. (7) But we have this treasure in jars of clay to show that this all-surpassing power is from God and not from us. Let’s read these verses from the Amplified version. In other words, we are going to have to die to self, the sin nature, our will. He died physically, and he laid down his will for God’s will. …so that the [resurrection] life of Jesus also may be shown forth by and in our bodies. Remember Romans 12—a living sacrifice? That is what it is talking about here. (11) For we who live are constantly [experiencing] being handed over to death for Jesus’ sake, that the [resurrection] life of Jesus also may be evidenced through our flesh which is liable to death. (12) Thus, death is actively at work in us, but [it is in order that our] life [may be actively at work] in you. Let’s look back at 2 Corinthians, chapter one for four great verses. The more that I understand these things and the more often I go through the process, the more confident I would be to enter in to it the next time a cross road comes around. Remember in Romans, “As big as the sin is the grace is bigger.” As big as the suffering is, the comfort is bigger. It is sufficient. No matter how much suffering that you face, enough comfort will be there, and then when you get through it, the sufferings are gone at least in that moment. You will get to keep the comfort. It is called growth. This could be a bit of motivation if you are concerned about other people because you know that you are not the lone ranger. If you can show them faith, and you can have faith and beat a particular challenge, opportunities will occur for you to share this with other people who face the same thing. Hebrews 12 has some fabulous verses beginning in verse 1. This is the section that the King James version calls the “Chastening of the Lord.” Disciplining is more accurate and does not have such a negative connotation. At this point, I would encourage you to read our book titled Don’t Blame God! If you have not read it, we have quite a piece in there about the chastening of the Lord. It is so sad for me to think of people not being convinced of God’s complete love, His care, His always fighting for the best. The word chastening means “disciplining.” It means “to make followers of.” It means “to help you to grow, help you to be a good follower.” It is a good word. This is referring back to the testimony in Hebrews 11 of all the saints in the Old Testament who are listed. (1b) …let us throw off everything that hinders and the sin that so easily entangles, and let us run [after we throw off] with perseverance [patience—hupomone—hanging in there] the race marked out for us. (2) Let us fix our eyes on Jesus, the author and perfecter of our faith, who for the joy set before him endured the cross, scorning [despising or putting down in his mind, ignoring] its shame, [not allowing that to affect him] and sat down at the right hand of the throne of God. I am supposed to fix my eyes on Jesus. So many things are vying for my attention, and a lot of it comes from the sin that dwells in me. I am to consciously look away from anything else —it might not be a horribly sinful thing, remember it is to be compared to knowing Christ. (4) In your struggle against sin, [I assume that you are in that category.] you have not yet resisted to the point of shedding your blood [Maybe you have, but these people had not]. The King James Version says scourge which the Greek word does mean to whip. In other words, figuratively, you do whip the old man into shape. Have you ever heard that phrase? You scourge the flesh. Another verse that you might think about is in John 15 where it says that he prunes the branches that bear fruit. On a tree, if they do not bear fruit, they just get thrown away. This is saying here that he prunes those that bear fruit. (7b) …For what son is not disciplined by his father? (8) If you are not disciplined (and everyone undergoes discipline), then you are illegitimate children and not true sons. (9) Moreover, we have all had human fathers who disciplined us and we respected them for it. How much more should we submit to the Father of our spirits and live! (10) Our fathers disciplined us for a little while as they thought best; but God disciplines us for our good, that we may share in his holiness. If I want badly enough to share in His holiness, then I will hang in the discipline. No discipline seems pleasant at the time, but painful…. It is painful. Sometimes the pain is unbearable. It feels like you are going to die to make the correct decision. …Later on, however, [That is down the cross road.] it produces a harvest of righteousness and peace for those who have been trained [exercised] by it. That word exercised is gumnazo, gymnasium. Sort of like, no pain, then no gain—stretch your muscles. In other words, do not let your feeling badly take over and make you turn off the path. We will close in the book of Peter. He was the one who we read about where Jesus said, “Get thee behind me Satan.” Peter had to get his priorities straight. We did an audio teaching called “Jesus Christ and You” about the life of Peter and his relationship to Christ. It has been a very popular teaching. It has a lot of humor, but it has a lot of pathos. Most of us can identify with Peter, at least in a lot of his life. I have never interrupted a vision on the Mount of Transfiguration. He did, which was gauche at best. Remember the verse “get thee behind me Satan,” how would you like to have Jesus say that to you about something that you said? You would feel pretty grieved. I think about the depth of Peter’s guilt and godly sorrow after the third time that he denied Jesus and somehow Peter was in the courtyard so that he could see Jesus eye-to-eye. Jesus was beaten to a pulp, and I cannot imagine the shame that Peter felt. I think he might have been tempted to kill himself. How priceless that Jesus after the resurrection said, “Tell the disciples and Peter.” Jesus specifically singled out Peter to make sure that Peter knows that he was up and alive. Jesus then worked with Peter, “Do you love me? Feed my sheep….” No matter what shame that you might feel about how you hurt someone that you love, Jesus Christ can help you bounce back from it. Peter suffered externally a lot in his life with persecution of all kinds. He also suffered internally, and he wrote some great things. (5) who through faith are shielded by God’s power until the coming of the salvation that is ready to be revealed in the last time. Many times the external trials cause the internal sin in us to raise its ugly head, and we do not always respond the right way. These have come so that your faith—of greater worth than gold, [This is about a crucible.] which perishes even though refined by fire—[that your faith] may be proved genuine and may result in praise, glory and honor when Jesus Christ is revealed. He will be giving that to you for every time that your faith proved genuine. I think that he thinks this is a big deal. I think that he understands how I sit in my room and look around, and I do not see him. I grab air, and I do not feel him. I say, “Hello,” and I do not hear him, but I am still going to hang around and keep going. (9) for you are receiving the goal of your faith, the salvation of your souls. This is the present working out. The context makes that obvious. The context here is that most people if you are doing good then they are not going to harm you. This is the proper translation that means you need to prepare to obey. …Always be prepared to give an answer to everyone who asks you to give the reason [logos] for the hope that you have…. Be ready to tell people what God’s Word says that gives you hope. This is an interesting word. If you divide re-spect, it means to look again. A human relations principal is here. Maybe take another look at a person. Do not go by your initial judgment. I can do that in a drop of a hat, but I am trying to think that I need to respect this person. It does not mean that I compromise and believe his error and all that. It means that maybe I look again and see what is behind what he is saying. That they do not have any grounds in which to say the slander. This is saying that it is God’s will to do good. Sometimes, because we live in a fallen world, we have to suffer for it. Now, verse 18 is the key verse because verse 19 until the end of the chapter is a parenthesis, so we are going to read 18 and into chapter four verse one. It will be death unto life. (1) Therefore, since Christ suffered in his body, arm yourselves also with the same attitude, because he who has suffered in his body is done with sin. (2) As a result, he does not live the rest of his earthly life for evil human desires [That would be living for himself, 2 Corinthians], but rather for the will of God. This was a little hard for me to grasp until I got the Bible called The Message by Eugene Peterson. Think of your sufferings as a weaning from that old sinful habit of always expecting to get your own way. Then you’ll be able to live out your days free to pursue what God wants instead of being tyrannized by what you want. He that loses his life will find it; he that finds his life and thinks that he wants to preserve it will be tyrannized. He will lose it. If I had to use an athletic analogy to how I understand this, I would say that you “play within yourself.” You do not get a big head and think that you can do things that you cannot do before you are able to do them. Unfortunately, this gives me the responsibility to still and quiet my soul. Many times I think that I have asked God to do things that I am supposed to do and vise-versa. Back to 1 Peter 4—”To cease from sin,” the King James is then “to be dead to it,” at least in a particular category or at a particular time, and then I can be more of a witness. Gosh, I want to be more of a witness; that is, when I speak, it is more of a first-hand accounting of what I have seen and heard and experienced in my relationship with Christ. The NIV said, “Arm yourself with the same attitude.” What attitude? (20) But how is it to your credit if you receive a beating for doing wrong and endure it? But if you suffer for doing good and you endure it, this is commendable before God. (21) To this [This suffering.] you were called, because Christ suffered for you, leaving you an example, that you should follow in his steps. If we follow in his steps, we are going to suffer. Since we know that, then we have to get the relationship of faith, character, and glory straight. We can then end up at the glory. (23) When they hurled their insults at him, he did not retaliate; when he suffered, he made no threats. Instead, [This is the attitude with which I need to arm myself.] he entrusted himself to him who judges justly. (24) He himself bore our sins in his body on the tree, so that we might die to sins and live [Note the order here.] for righteousness; by his wounds you have been healed. I think that this means more than just physical healing. That is external and internal. Again, I have not suffered that much external persecution, but from the little bit that I have suffered, it has seemed to me more painful to have the internal not resolved then to be suffering from external persecution when I knew that I was in the will of God. (14) If you are insulted because of the name of Christ, you are blessed, for the Spirit of glory and of God rests on you. (19) So then, those who suffer according to God’s will should commit themselves to their faithful Creator and continue to do good. Humble yourselves, [I wrote in my Bible, John, humble. What does that mean? Die to yourself. Choose his way rather than my way.] therefore, under [Remember, hupomone, to abide under which is translated patience, perseverance.] God’s mighty hand, [That might have a negative connotation to some people at first hearing, “God’s mighty hand.” No, the mighty hand is for us.] that he may lift you up [With His mighty hand.] in due time. Perhaps you are familiar with the word kairos, at the right moment. If I will take the cross road, if I will stay on it, if I will abide under, if I will keep going, a kairos moment will happen. It is then that His might will lift me up, but if I do not stay under His mighty hand when He reaches to lift me up, I will be gone, and He will not be able to lift me up. The lifting up is the resurrection of life and the humbling is the death of self. (7) Cast all [Throw all of it.] your anxiety on him because he cares for you. [The more that I believe that He cares for me the more I will cast my anxiety on Him.] (8) Be self-controlled and alert. Your enemy the devil prowls around like a roaring lion looking for someone to devour. We need one another. Your life makes a difference to me. My life makes a difference to you. And the God of all grace, who called you to his eternal glory in Christ, after you have suffered a little while, will himself restore you [mend that which was broken.] and make you strong, firm and steadfast. I would say that is character. See the suffering, faith, character, and glory in those verses? This is about the struggle to maturity. This is about walking the cross road which is set before me. This is about understanding the joy that is down that cross road, and that I make the choices and expect the kairos moment to be ahead—so much that I keep walking. A big key to running to Him in every situation and abandoning myself to His will is to know how mighty God’s hand is and how loving and kind He is. It has helped me, and it would help you to spend some time regularly thinking about how much God and His Son love you, how passionately, how relentlessly, how specifically, and how they long to give you only their best (Eph. 3:20). Remember this when you come to a cross road, so like Jesus, your choice will be “not my will but thine be done.” Because Jesus made the right choice, the Cross, he now enjoys resurrection life, and he is ready, willing, and able to give you and me the same thing in any situation if we will simply take up our cross and follow him.